I first encountered the concept of computer networks during a summer job I had at Iskra Delta. Someone pulled me to his terminal and said “here, you must see this”, and showed me how you could copy files from one minicomputer to another. That was interesting, but I was even more impressed with the ability to log into another minicomputer, particularly going from a VAX/VMS to a PDP-11 (or vice versa). You might have guessed that I’ve seen DECnet Phase IV (or maybe Phase III). 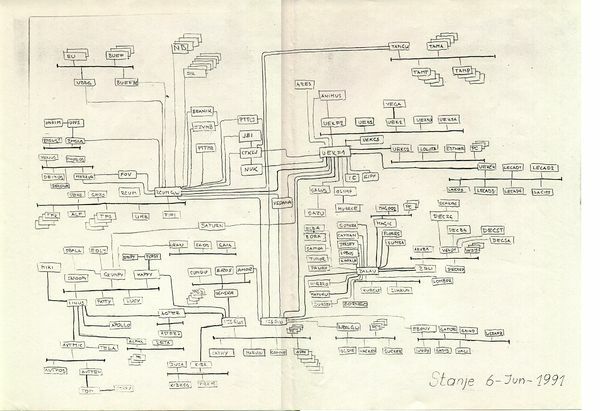 It never really took off on the PDP-11 minicomputers because the networking components took too much memory – these machines had up to 1 MB of RAM with most of them having 64K – 256K – but VAX/VMS was a totally different story, particularly a few years later when even the low-end models shipped with megabytes of memory. In those days a large group of enthusiasts build a country-wide DECnet network (SLOvenian Network – SLON – which happens to mean elephant in Slovenian) that had hundreds of nodes… all based on “let’s get together” mentality and people willing to buy a leased line to someone who had a spare RS-232 port. We exchanged emails, participated in discussion groups (I’m still looking for a discussion forum that would be as elegant as VAX/VMS Notes) and exchanged information way before we first heard about Internet (which happened in late 1980s). Most of the leased lines used asynchronous modems connected directly to terminal ports, resulting in link speeds between 9600 bps and 38.400 bps. While the baseband modems used in those days provided link speeds between 64 kbps and 1 Mbps, the synchronous ports were usually way too expensive to be used for what was effectively hobbyist networking. Some of these installations eventually started using a technology faster than leased lines based on thick coaxial cable that had to be yellow – the first Ethernet. A few years later, thin coax Ethernet appeared, local area networking exploded… and eventually we discovered the weird thing called TCP/IP. SLON continued to run till at least late 1990s (with some islands still running after 2010, see the comment from Aleš Časar), and the latest node name file (think /etc/hosts) has over 1500 lines – we got to a point where a single DECnet area became overcrowded, so large users, particularly those using DECnet on PCs, moved into their own DECnet areas. You can't leave comments on this web site, but you can add them to this blog post.